SUSAN SIMON SAYS: Mango, Tango, Bango!!! It's the time of the year -spring when those gorgeous little kidney bean-shaped mangoes, the ataulfo, arrive from Central America to the produce bins of our nearby markets (they come out again in the fall). In markets with lots of space, the mangoes are displayed in their flattering, lavender colored boxes. The ataulfo that I bought were called champagne mangoes and were imported exclusively by the Ciruli Brothers . They're also called honey mangoes or Manila mangoes. Regardless of their appellation they are the supreme mango, almost string less - none of that annoying fibre stuck between your teeth - with a firm, yet flexible texture. Eating an ataulfo mango is something like eating pure mango flan. Its firm flesh makes it the ideal ingredient for cutting into a perfect little dice and then adding to other ingredients to make a savory or sweet salad, chutney or salsa. I made my favorite Seychelloise-style fresh fruit chutney to accompany the other components of a colorful meal. 3 Ataulfo mangoes, peeled, cut into approximate 1/2-inch pieces. After it's peeled the mango is easily cut from top to bottom off both sides of the pit, and then another slender slice on each side of it. These sections are ready to make into perfect diced pieces. In a medium bowl, toss all the ingredients together. Cover the bowl and let sit in a cool spot for at least an hour until ready to serve. Leftover chutney may be stored in a refrigerator in a tightly sealed container for up to a week. The thing that gets me to decide what to eat as much as the ingredients themselves is their color. The more vibrant the color the more I'm attracted to the ingredient. To certify what seems to be whimsical reasoning I might add that the more vibrant the color the higher the nutritional value contained within the produce. Ah - what a bonus. RED fruits and vegetables, especially tomatoes contain a high amount of lycopene - an antioxidant. ORANGE & YELLOW produce, including sweet potatoes, squash, pineapple, mangoes and carrots are high in beta carotene = vitamin A which helps dispel depression, headaches, heartburn and high blood pressure. BLUE & PURPLE ingredients such as blueberries, blackberries, purple grapes, plums and eggplant contain anthocyanins = antioxidant. GREEN the color that gives the whole category its name. This produce is obvious, and gets its color from chlorophyll which = vitamins A,C,& K. The fiber contained in the greens goes a long way to lower cholesterol. Add, say, a bright, beautiful pile of pickled red cabbage on the plate with a mound of mango chutney and you've got another part of a trio flavors that will add up to a meal filled with more dips and swirls then most tangos danced in Buenos Aires. For the pickled cabbage recipe I'm going to send you straight to my friend, Amy's blog, Coconut and Quinoa . The protein portion of this group is my version of age tofu - fried tofu. In the Japanese kitchen cubes of tofu are covered in corn or potato starch and fried until golden then served in a hot broth made with mirin, dashi, sho-yu then topped with finely chopped green onions, and sometimes grated daikon radish. 1. Fill a small skillet, over medium heat with about an inch of oil. Add the sliced shallots and cook until golden - stir ocassionally or else the ones on the outer edge of the skillet will burn. Remove the pale gold (they'll continue to cook as they cool) shallots from the oil with a strainer and drain on paper towels. Reserve the oil. 2. Add the rice flour to a dinner plate. Coat all sides of the tofu with the flour. 3. Reheat the shallot-flavored oil to medium. Add the tofu, in batches, and fry until golden on all sides. Drain on paper towels. Serve hot - or at room temperature. 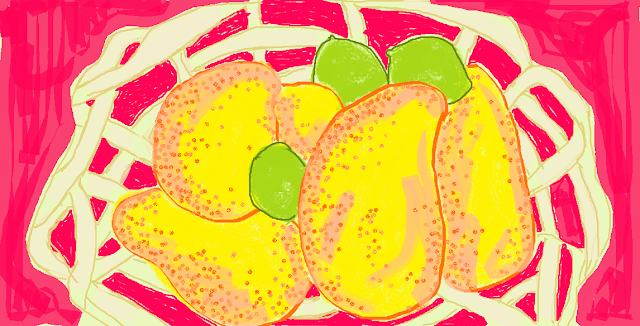 mango chutney. All the better if you have a turquoise, navy blue or lime green plate for serving. Bango! -here's a meal of creamy tofu covered with a crackling crust topped with what seem to be mini fried onions rings, crunchy pickled cabbage, and fragrant, tangy fresh mango chutney. Healthy? OMG, Yes! For me, this meal tastes even better when eaten with chopsticks. This vintage sofa, newly upholstered with Lisa Corti fabric, from John Derian nourishes me visually in the same way as the meal I've just described. Remember, feed all your senses.